My name is Susan and I am a produce-aholic. I went to two different produce markets in one day. I spent around $82. I know that some of you may not comprehend the tale I about to tell, so just imagine that I am talking about shoes. In a mall. When I walk into a muggy-aired, rustic structure with sawdust on the floor, ceiling fans spinning overhead and bright, freshly harvested stuff in wooden crates, my mind begins to whirl. Recipes dance through my mind like sugarplum fairies. The thing that put me over the top this week was a massive bag of White Acre peas. I'm really tired of buying the puny, not-quite-a-pound bags you often see in the farmers' market. The one I got two weeks ago sold for $6... they weren't enough. I need more. To make them even more appealing, if that's even possible, the ones I purchased had been locally grown and were shelled THAT morning! 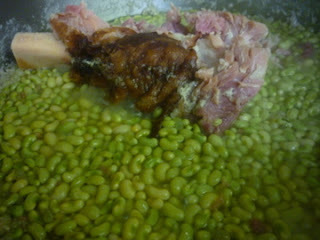 I plan to portion the peas into freezer bags and voila... I can have them whenever I want! Have you ever bought any fresh peas? The frozen ones are good, but OMG... I'm like a recovering addict when they aren't in season. I make them with a bit of chopped onion, a ham bone and water, salt and pepper. How simple is that? If you aren't currently in possession of a lovely ham bone, I'm so sorry for you. Just pop in at your local Honeybaked Ham store and ask for one. They'll sell you a meaty, decent-sized one for around seven dollars. When served over brown rice and accompanied by a lovely green salad, they ARE the main course. Amazing flavor, tons of protein... never has there been a more comforting meal. I was planning to make gazpacho on Saturday. 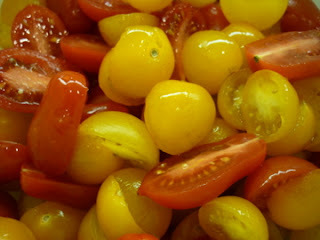 While calculating, I mentally transposed the quantity in a recipe I had read for an heirloom tomato salad. I bought four pounds of tomatoes. Do you know how many tomatoes that is, roughly? A lot! I thought I needed four pounds. In reality I needed five. Tomatoes. FIVE tomatoes. Right at this moment, staring back at me with their big brown, accusing eyes is SIXTEEN large beefsteaks. I really hope my family can embrace the Tomato Festival taking place at our house in the next few days. Woohoo! ... I can say that I'll try to do better next time around, but we all know that would be a little fib.